An often requested feature in GlotPress has been to be able to support locale “variants”. This has been tracked as issue #226 on GitHub and has been open since January 2016. Locale variants allows for a “root” language to have one or more “variants” of the language in which the variants automatically inherits the translations of the root for any missing translations. This is useful for many popular languages, for instance English, Spanish, French, etc. where the vast majority of the translations are likely to be identical with minimal differences for local dialects. PR #747 has recently been created with a solution for locale variants. Ok so what does it look like? The first thing to note that all of the below is based on the current PR, which may change by the time it is actually merged in to GlotPress. One of these things isn’t like the others, but two of them are very close to being the same. In the above situation, English (Canada) would inherit the translations form English (United States) for any translations that were not defined. You’ll notice a new entry in the legend at the bottom of the page, “Root translation”, this indicates any translation shaded in this color (slightly darker green) is inherited from the root language instead of being marked as untranslated (white). Notice the addition of the “Root Translation” information under the Meta heading along with a link back to the root translation. If you change the translation here and save it, a new translation entry for the locale will be created and the root translation will no longer be inherited. Looks good so far, so now what? The PR is mostly complete, however we are looking for some input on one part of the system; the relationship between root and variant languages. As part of the PR an initial pass at defining the relationships between languages has been made but we are looking for input from the community to ensure they are correct and for any missing relationship that make sense. One item to note is that root to variant relationships can only go one level deep, so you cannot define a variant of one root as the root of another one. So in our English example, you cannot do English (United States) -> English (Great Britain) -> English (Canada). This was done on purpose to ensure translations did not degrade in quality as they moved farther away from the original source language. A brief note about the slightly strange English root/variants, English (United States) was chosen as the root due to the vast majority of code that is written with it as the language of the source code. The root/variants relationships are assigned during the load of the locales file and can be altered for individual sites either through the use of a custom locales.php (using the GP_LOCALES_PATH define) file or through a plugin that hooks in to the GP_INIT hook. Feedback on the above relationships (or any other part of the PR) is most welcome as always, you can visit the GitHub Issue or PR to participate. Hello everyone, GlotPress 2.3 was released back in February and in case your were wondering, we’ve been quite busy working on the next release! GlotPress 2.3.1 has been stable for some time, with the next planned release being 2.4. PR636 – 628: Support XLIFF tags in android imports. 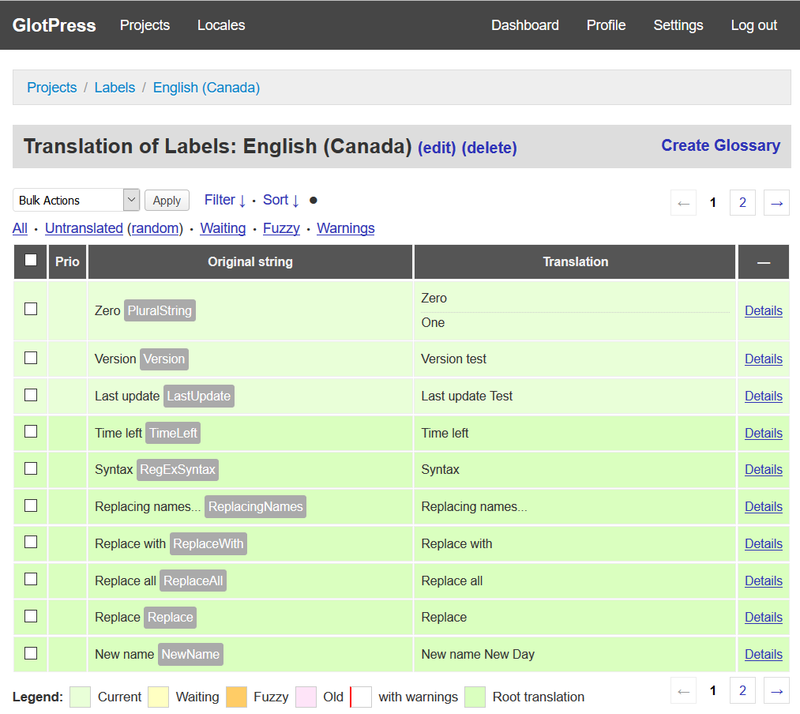 PR705 – 704: Add glossary tooltips after editing a row. PR708 – 707: Abort changing status when the translation has be altered. PR715 – 701: Fix entry/display of translations that start with a blank line. PR738 – 732: Fix incorrect default in for_export() function for filters. PR740 – 732: Make sure to set the default filter on the export link. PR744 – 743: Fix incorrect variable name for `German (Switzerland)’ google code. PR741 – 733: Add counts to filter links in the translation page. PR771 – 758: Make sure to hide the div that jQuery UI creates for tooltips. PR766 – 763: Revert any translations changes when cancel is clicked. PR716 – 704: Alternate add glossary tooltips after editing a row. PR739 – 734: Add ‘ing’ and ‘ed’ to suffix list for glossary term matching. These PR’s represent incremental changes and bug fixes over GlotPress 2.3.1. In addition, the following items have been marked for the 2.4 release and are either awaiting merges or PRs. Taken together the merged items as well as the marked for 2.4 could support a 2.4 release. Both of these have API changes to them and are significant features for GlotPress and should be targeted at a major version release, aka 3.0. PR454 – 452: CLI: Remove deprecated GP_CLI classes. You mean there’s even more? IS304 – Translation header needs some work, because it does wrap weird. This proposal is to fold the 2.4 items in to the 3.0 milestone, add the above “low hanging fruit” design issues to 3.0 and assign 3.0 as the next release for GlotPress. There is one additional issue that would have to be opened, as we have merged several PR’s that have an “@since 2.4” already, we’ll have to create a PR to update those items to 3.0. To avoid having to update individual PR’s in the 2.4 tag, the recommendation is to merge all remaining 2.4 items and then just before the beta release, do a single PR to update all “@since” tags from 2.4 to 3.0. Surly that must be it? Feedback on the above proposal is most welcome and we will be granting final approval for it at next weeks GlotPress meeting in Slack assuming no show stoppers present themselves. As always, you can visit the GitHub Issue and PR tracker to participate in any of the above items. GlotPress 2.3.1 is now available for download or update in your WordPress dashboard! This is a bugfix release addressing issues found in version 2.3. #656: A locale glossary no longer requires a project glossary to exists to show terms of it. #664: Querying translations by priority was broken, now fixed. #673: An incorrect nonce check prevented locale glossary imports. #675: Flushing an existing glossary on import works now as expected. #655: A gp_locale_glossary_path_prefix filter has been added to allow filtering the locale glossary path prefix (/languages). Thanks to all contributors of this release, namely Alex Kirk, Dominik Schilling, Greg Ross, and Yoav Farhi. We’re pleased to announce a new release of GlotPress. Version 2.3 of GlotPress, named “Statler”, is now available for download or update in your WordPress dashboard. The focus of this release was adding support for JSON formats and for glossaries per locale. Support for locale glossaries, a glossary for all projects of a locale. Support for JSON format for JED and plain JSON, for imports and exports. Ability to mark translations as fuzzy. New keyboard shortcuts for copying original strings. Extended meta data to all file formats that can support it. Contributors of this release: Alex Kirk, Anton Timmermans, Dominik Schilling, Greg Ross, Nikhil, Pascal Birchler, Sergey Biryukov and Yoav Farhi. If you want to follow along or help out, please check out our repository on GitHub. The release candidate of GlotPress 2.3 is now available! The release candidate can be downloaded from GitHub. For more information about what’s new in version 2.3, check out the beta 1 blog post. The final release is targeted for February 6th, 2017. The first beta of GlotPress 2.3.0 is now available! The focus of this release is adding support for JSON formats and for glossaries per locale. In this version 24 issues were solved and 30 Pull Requests were merged, a total of 179 commits. Contributors of this release: Alex Kirk, Anton Timmermans, Dominik Schilling, Greg Ross, Nikhil, Pascal Birchler, and Yoav Farhi. The next release (RC1) is targeted for January 24, 2017.